Calvin Klein Eternity Summer - 100ml EDP - $98 - an exotic floral fragrance that evokes a tropical paradise with top notes of pear blossom and bergamot; a heart of exotic frangipani flower, jasmine and tuberose mist; and a base of warm and sensual musk, vanilla and blond woods. 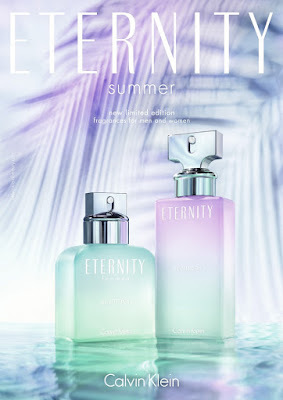 Calvin Klein Eternity Summer for Men - 100ml EDT - $89 - bring the smell of refreshing, cooling tropical breezes with top notes of cilantro, lime and bergamot; a heart of a sage and basil; and base notes cedarwood, amber and musk. Available now at Hudson's Bay, Shoppers Drug Mart and Murale store across Canada. Quo Lip Velour - with swatches! MAC Vampify Lipgloss - with swatches! Test Driving - Cosmetic Facial Acupuncture! Summer hair must-haves from Marc Anthony! Quo Stain'n Love Lip Gloss - with swatches! This week I'm obsessed with... CND Rescue Kit! OPI Retro Summer 2016 Collection - with swatches!